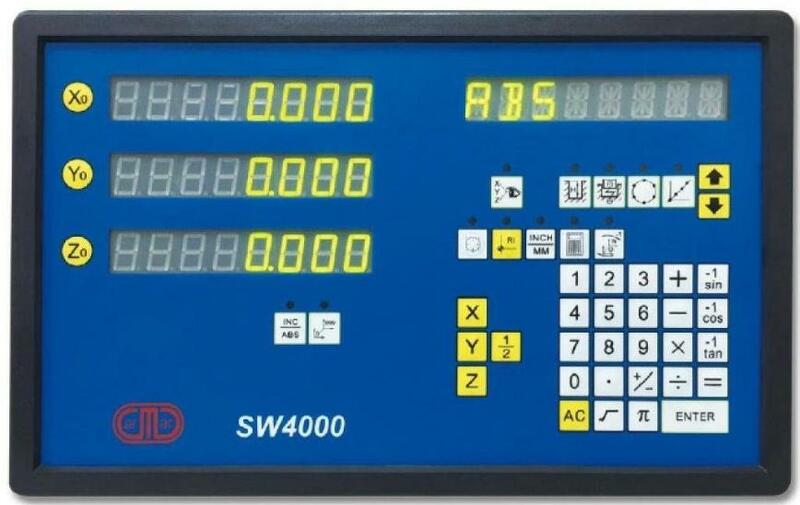 SW4000 series multi-functional digital readout can be installed in all kinds of machine tools to supply the positioning and metrology functions. We have DRO for 2 axis, 3 axis, EDM and 8 axis. Suitable for various kinds of machines. Coordinating with linear scale, this digital readout analyzes, processes and displays the data of displacement measurement. 1. Adopts self-developed 24-bit IC and when resolution is 0.001mm, the speed of counter is 4m/s. 2. Anti-jamming capabilities of power supply and signal can be more than 2200V. 3. The indicator indicates the work status. 4. Premium quality and durable panel, which is convenient to replace. 5. Recalls the last position after power failure without battery. 6. Can be connected with linear scale or encoder to carry out processing and measuring for various kinds of machines. 8. Wide range of input voltage (AC 90V～240V).